From the 19th of November to the 23rd of November, between the hours of 12:00-17:00 the artist, scholar, printmaker and mother Rachel Epp Buller can be visited at Upominki, Rotterdam, where as the artist in residence she will embroider words on in a durational performance devoted to care and listening. The artist welcomes community members to join her in embroidering, crocheting, knitting, or just in conversation. Epp Buller’s latest work Taking Care explores letter-writing as an act of care and a bond of human connection that is directly connected to slowing down, taking time to take care, with our words and for each other. 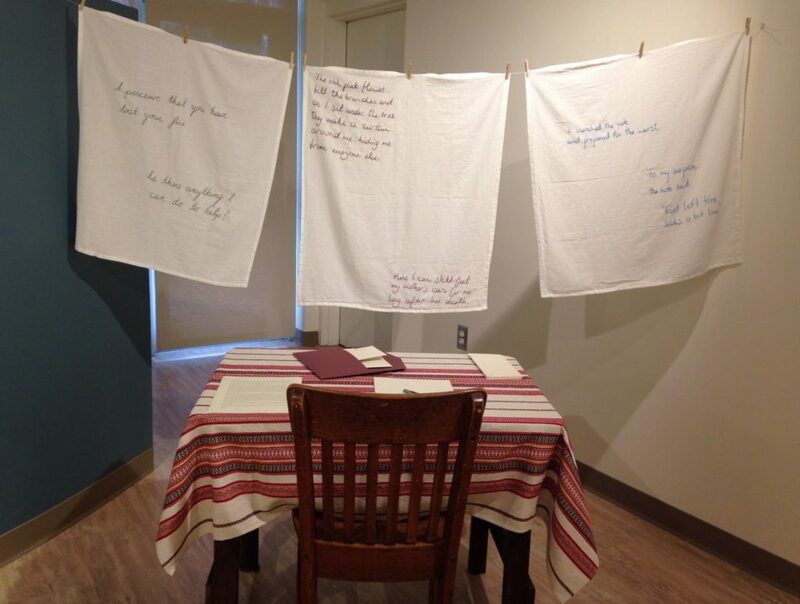 In Taking Care, the artist invites participants to write her a letter that recounts an act of care, large or small; she offers to receive these words, to intimately listen, and to embroider the words to make publicly visible these often unseen labors. The residency period will end in the performance of ‘Dear friend’, a performative reading of letters across time, written by Rachel Epp Buller and performed together with the artists Deirdre M. Donoghue, Barbara Phillip, and Weronika Zielinska-Klein. This performative reading of letters and epistolary texts considers how feminist maternal relations of care and attunement in the present, and a willingness to listen to voices from the past, might help us to radically reorient our ways of relational being for the future. Doors will open at 18:00, the performance commences at 19:00 and lasts for 1 hour. Before the performance there will be soup served and afterwards the bar will be open. Dr. Rachel Epp Buller is a feminist art historian, printmaker, book artist, professor and mother of three, whose art and scholarship often speak to these intersections. Her writings on art and the maternal include Reconciling Art and Mothering (Ashgate/Routledge) and the forthcoming Inappropriate Bodies: Art, Design, and Maternity (Demeter). Her current creative work explores letter-writing as a radical act of care and listening across time. Her curatorial projects often involve collaboration, across disciplines and across countries. She is a Fulbright Scholar, a board member of the National Women’s Caucus for Art (US), a regional coordinator of the international Feminist Art Project, and current Associate Professor of Visual Arts and Design at Bethel College (US).